The problem with pictures is that things are not always the way they appear. This chair ( which I rather unimaginatively dubbed phul ( should it have even more unimaginatively been called patti??)) appears at first sight to be supremely uncomfortable and somewhat delicate. The first reaction people have is "I dont think Im sitting in that for love or money." Which makes their reaction to sitting in it all that more fun. I dont know whether its the fact that its comfortable enough to sit in or the relativity of their expectations and experience (im expecting a certain "anonymous" to rap my knuckles for language), but the expressions are fun to watch! 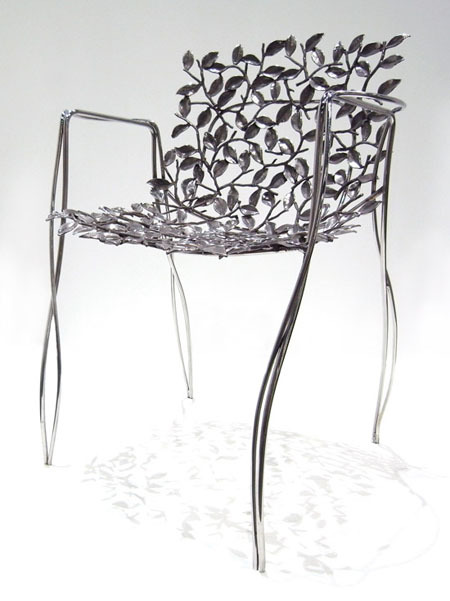 The chair is made in stainless steel, assembled from individually cast elements, which means no two chairs are identical. The chairs stack!! The chair looks absolutely gorgeous... a total style statement! Love it! I'm a follower of your blog but never commented before. These chairs are very pretty. I've linked to your post on my blog, hope you don't mind. love it! I am posting it on my blog now! How do I find out now to purchase these chairs? How can I purchase these chairs?